The topic of aviation has again been in the top news since low-cost provider Ryanair announced its flights to Ukraine. This decision raised lots of questions, which were underestimated just a while ago. The expert community is discussing the peculiarities of state support for airports and airlines as well as the limits of airports’ freedom to make special service offers and discounts to different airlines. A lot of attention is now being given to airport development strategies. State-owned Boryspil International Airport declared its striving towards a hub-model with Ukrainian International Airlines as the base airline. At the same time, the Ministry of Infrastructure welcomes low-cost airlines and expects the cheapening of tickets to raise the popularity of aviation transport among Ukrainian citizens. Regional airports such as Lviv, Chernivtsi, Zaporizhzhya, Vinnitsya, Rivne and Kharkiv are increasing their traffic mainly by charter flights to attractive tourist areas and European airports that serve as hubs. Domestic flight traffic remains low without any serious progress in this regard. But the minister announced that negotiations with a new investor for a domestic carrier are in progress. The New State Program on Civil Aviation Safety came into effect on 12 April 2017. The Program, which is in line with US and EU standards, establishes new requirements regarding collection of advance passenger data (API) and its further transfer to the state authorities. New rules apply to international flights from/to Ukraine and transit flights through airports located in Ukraine and shall ensure aviation safety, regularity and effectiveness of flights. Signing of the initialed Common Aviation Area Agreement between the EU and Ukraine is again postponed for an indefinite period of time due to Brexit and the Gibraltar territory issue, which has no signs of being resolved soon. In 2016 the global shipping industry found itself struggling to cope with negative changes brought about by the crash of the financial market in 2008. The full restoration of shipping markets is an issue for the future. Despite small improvement in the European market, the Japan and USA markets are showing zero growth or even stagnation. Modest Chinese growth is not enough to cause substantial demand in maritime industry on a global scale. The market is still showing overcapacity. “K” Line, Yang Ming and Evergreen Line, which shared space with the carrier on ships. Hanjin’s bankruptcy would inevitably have an impact on the other alliances of ocean carriers as their members would seek for security against each other to minimize the risks of insolvency of any alliance member, which may lead to a more conservative approach towards the conditions of the vessel sharing agreements. As usual, Ukrainian maritime law practice include charter party and bill of lading disputes, cargo and insurance, claims as well as personal injury and compensation claims. The liberalization of port industry led to execution of a number of long lease land agreements between Ukrainian port authorities and private port operators which give them certainty to expand their investment activity. Cases related to violation of the Crimea sanctions regime are still important and include now not only administrative cases but also criminal ones, with detentions, arrests and fines imposed within the framework of contradictory court practice. Whilst ship arrest cases appear to be considered more often by Ukrainian courts, current inconsistency between Ukrainian legal procedures and International Brussels Convention (1952) rules make such applications not an effective legal instrument in the majority of cases. One may hope that new codes of procedure which could be adopted by the Ukrainian Parliament in 2017, containing novellas which are in line with the rules of the Brussels Convention, will improve the situation with Ukrainian ship arrest practice. ECOVIS Bondar & Bondar Law Bureau has an established market niche in the aviation sector. Clients include Ukraine International Airlines, KLM Royal Dutch Airlines, Lufthansa Group, Swissair, Hahn Air, Aviation company Kharkiv Airlines, Boryspil International Airport, Chernivtsi Airport, Donetsk Airport, and a number of handling and catering companies operating at Ukrainian airports. The team advises clients on various legal matters, including corporate, antimonopoly, dispute resolution and tax. The firm recently represented a group of private investors in connection with the financing, acquisition, sale and leasing of 3 Boeing aircrafts. Recognized Oleg Bondar is a lead partner. Ilyashev & Partners has a well-diversified practice as it present both in the aviation and maritime areas. The firm acted for its long-standing client, State Enterprise Antonov, in numerous cases: advised on restructuring of debts owed to the state on bonds of the Aviant Plant; protected their interests in the dispute with the Ministry of Defense of the Russian Federation on recovery of penalties for violation of terms under a state contract and represented the company’s interests in disputes with OJSC Aviakor Aviation Plant and OJSC Aviakor on recovery of losses under the License Agreement for the right to use the trademark. Recent maritime highlights covered representation of Optima Shipping Limited in a dispute with Horndom Limited about non-fulfillment of the freight contract and protecting the interests of the ship-owner; Cormorant Maritime Limited in eight parallel arbitration proceedings at LMAA regarding the failure to pay the freight amount. In addition to the procedures before LMAA the firm also dealt with the arrest of ships in Georgia, Turkey and France and coordinated the provision of legal services in several jurisdictions simultaneously. Senior partner Roman Marchenko, known for his litigation performance, acts a lot in the transport sector. In 2016 Ante Law Firm extended a number of clients in its unique aviation niche. Bravo Airways, Flydubai, Style Avia LLC, Pavo group, Avialiga, Lufthansa, Austrian, Emirates, British Airways, Alitalia, UMAir, Association of Aviation Entities of Ukraine are all on the firm’s client list. Ante’s lawyers provided legal support regarding court claims as well as consulted foreign airlines on Ukrainian market entering issues. The team was involved in taxation and antitrust, public procurement issues for transport clients. In particular, Ante acted for the interests of a diesel supplier before the AMCU with regard to Ukrzaliznytsia’s public procurement procedure conflicts. There are a few big agent defaults and bankruptcy procedures that are ongoing where Ante acts for a number of airlines. Highly-experienced partner Andriy Guck is among the most recognized aviation law experts in the market. Market heavyweight Asters has remarkable clientele from the areas of aviation, railways and shipping. The firm regularly advises aircraft and aircraft parts manufacturers, Ukrainian and international cargo and passenger airlines, airports, aviation insurers, tour operators and other aviation industry enterprises on various corporate, finance, regulatory, antitrust, tax, administrative, enforcement, employment and litigation matters. For example, the firm advised the Wizz Air Group on corporate governance streamlining, personnel employment, outsourcing, training and licensing, obtaining work and residence permits for foreign employees, compensating employees and contractors, hiring and dismissing company’s managers, taxation of airline operations, and various aviation law matters. Notably, Asters acted as a legal counsel to Ukrzaliznytsia in connection with restructuring of USD 500 million Eurobonds. Partners Oleksiy Demyanenko and Vadym Samoilenko are the key contacts. The Ukrainian office of Baker McKenzie has a thorough understanding of the aviation industry that was gained through long-term involvement with airlines, Governments and airports. Its sectoral experience includes privatizations, corporatizations, capital raising, financing, general corporate and regulatory advice. The international firm has a sharp footprint of transport infrastructure. The team acted as legal counsel to Cargill in respect of an agreement with MV Cargo to enable the construction of a new port terminal in Yuzhny. Serhiy Piontkovsky led the team. Baker McKenzie is also most active in financing transactions for infrastructure projects. Serhiy Chorny is the main contact for project finance related matters. Odesa-based Interlegal is highly recognized for its complex maritime practice. The firm represents ship and cargo owners, insurers, freight forwarders, charterers, carrier lessees in maritime, shipping, transportation and logistics, including assignments intersecting with international trade matters. The firm’s caseload includes the sale of the floating dock, representing ISRZ due to debt recovery for wharf dues from foreign-going vessels as well as successfully settling numerous incidents under maritime law. Arthur Nitsevych, Nikolay Melnykov, Natalia Myroshnychenko and Artem Skorobogatov are well-known names in the maritime niche. During 2016 the maritime and law practice of ANK Law Office acted as legal counsel to leading world P&I Clubs, insurance companies on issues related to payment of compensation to seafarers arising out of employment contracts. For example, the office acted as legal counsel to SKULD P&I Club in the case on payment of compensation to the widow of a deceased seaman who died on board a vessel. The firm acted as legal counsel to Ingosstrakh Insurance Company in relation to the insurance event with the Ukrainian tug Neftergaz-67, which collided with bulk vessel Yao Hai in the South China Sea. The team also provided legal support for deals on the sale and purchase of vessels and marine yachts, vessel mortgages and helped clients to settle conflicts related to damage or shortage of cargoes under the contract of sea carriage and other maritime cases. Major clients in 2016 are British Marine, BRITANIA P&I, Monomakh Insurance Company, MSC Shipmanagement, NORTH P&I, London P&I, SKULD, West of England P&I, Ingosstrakh, TT Club, UK P&I Club. Alexander Kifak and Artyom Volkov act as responsible partners. In 2016 Sergeyevs’ Law office, an Odesa-based boutique with a large proportion of maritime clients (SC V. Ships, SC CMA Ships Ukraine, ABC Maritime LLC, Wilhelmsen Marine Personnel Ltd, BSM Crew Service Centre Ukraine Ltd, SC Danaos Ukraine, Deep Sea Supply Crew Ltd) in their portfolio, has been working on shipping and foreign investment projects, including accompaniment of current activity of their clients with the use of international and foreign law, and representation of interests in foreign jurisdictions.Yuriy Sergeyev and Svetlana Sergeyeva led the practice. Odesa-based PRAVO Law Office is engaged in maritime and corporate law, as well as commercial litigation and arbitration serving various international and Ukrainian clients. Ship arrest is one of the practice areas of their activity. Andriy Kostin, managing partner, is recognized attorney in maritime law. Last year he was included in a recommendatory list of arbitrators of the Maritime Arbitration Commission at the Ukrainian Chamber of Commerce and Industry. Arzinger provided legal support to a major domestic trader and producer of vegetable oils and fats with respect to investment and development in the port of Yuzhny. The team also supported the construction of a sea grain terminal allowing the maintaining of marine vessels for the organization of agricultural exports and represented an international logistics company in a dispute on the termination of an investment activity contract and of a mortgage contract. Odesa-based partner and head of South-Ukrainian branch Andriy Selyutin is a key contact. Maritime law is the core focus of Odesa-based LeGran.TT. The team represents clients before Ukrainian courts and international arbitration courts in various matters in the area of maritime law. The expertise given related to charter party issues, cargo interests, shipping agreements, accidents, employment issues, payment claims. Olympic Coupe International, a sea port operator, was represented in USD 8 million tax disputes with the Ukrainian tax authorities related to alleged simulated contracts involving the parties as well as in a dispute with a Ukrainian sea port authority on discounts for access to port terminals. Transship, an industry leader in roadstead cargo trade and operations, was represented in matters of vessel arrests in the Nikolayev and Odesa Sea Ports, also a client’s employee, master of the Jupiter vessel, was represented before the European Court of Human Rights in an international dispute on illegal administrative claim for alleged non-declaration of goods in Nikolayev Sea Port. Tatiana Titarenko, managing partner, is the key individual. AEQUO focuses on infrastructure and transport issues across a variety of sub-sectors, including roads, ports, warehouses and other commercial logistics, and aviation, marine, railroad and automobile. Last year the firm acted for some significant infrastructure clients in Ukraine, including TIS Group of Terminals and Illichivsk (Chornomorsk) Grain Port. Partners Denis Lysenko and Yulia Kyrpa head a multi-force practice. Reputable Vasil Kisil & Partners advised AWAS, international aircraft owner and lessor on Ukrainian law matters on corporate, debt and securities restructuring due to the change of financing partner from BNP Paribas to Wells Fargo Bank. Overall transactions involved restructuring of legal ownership to a number of aircrafts operating in 30 jurisdictions. Specific aviation law experience is part of the firm’s remit. The firm also represents an international shipping company in the insolvency case of Black Sea Shipping Company (BLASCO) and acts for logistics company Manushar Ukraine in a dispute with the tax authorities. Partners Oleg Alyoshin and Alexander Borodkin are noted as key contacts. The year 2016 was a fruitful one for the transport, maritime and shipping practice at Eterna Law. The firm provides legal services with respect to investing in the port infrastructure of Ukraine. Oleh Malskyy, partner and head of corporate and M&A, was at the forefront of clients instructions. Eugene Blinov and Maksym Uslystyi were also actively involved in the practice development. AGA Partners advises international traders and ship-owners in the course of transportation of goods by sea. Recent cases in maritime and shipping field concern advising clients on issues of recovery demurrage and detention costs that have arisen during fulfilment of international sale contracts. Ivan Kasynyuk and Irina Moroz act as lead partners. 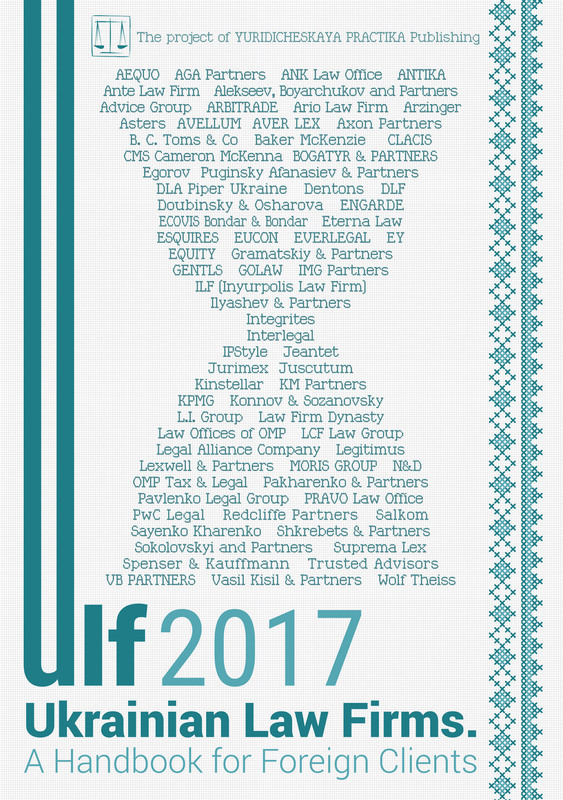 The rapidly growing Ukrainian law firm SupremaLex is a new name in the aviation and maritime fields. The firm provides legal support to shippers and servicing companies in aviation, vehicular transport and carriage of goods by sea. Clients include Khoriv-avia, Ukrainian Helicopters, Ukraine International Airlines, Imperator-avtotrans, The great bear (BM-TRANS), Cordo International, Yunico Logistics Baku. Last year the firm supported a dispute on failure to carry out freight international shipping terms by a Ukrainian carrier, and protected the rights of an aviation company to intellectual property objects in an unfair competition case. Managing partner Viktor Moroz is the main rainmaker and project leader. Gramatskiy & Partners is traditionally active in transportation matters. In 2016 the firm worked for a sizeable pool of projects such as signing of general cooperation agreements between Ruskon Ukraine, Finrostorg Group and stevedoring and survey companies; supports acquisition and registration of vessels by private individuals; supported transit transportation and transshipment of goods from vehicles to the sea. The practice is coordinated by Iegor Ignatichev. The transportation practice of KM Partners includes supporting investment in projects for the creation, reconstruction and operation of transport infrastructure, as well as providing comprehensive support for those relationships that arise in the provision of freight services between different transport institutions, businesses and customers. Alexander Minin and Maxim Oleksiyuk are the lead partners. Lviv-based Advice Group acted as the sole legal advisor in providing comprehensive services to Austrian Airlines AG in its unveiling of a new Client Services Centre in Lviv. The case was led by partner Oleh Kyryievskyi. Attorneys’ Association Gestors acted as legal advisor to Chornomornaftogaz with regard to controversial issues of the return of the Titan-2 crane vessel to its owner. The project is being fulfilled under the guidance of Andriy Tsvyetkov.